Rodney Dangerfield used to frequently say, "I get no respect!" The same can be said for President Millard Fillmore. 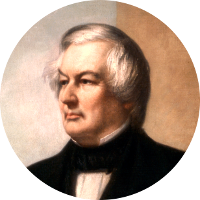 In polls, President Fillmore is often chosen as the "most forgettable" president. Most Americans have never even heard of him and when they have, it's usually in a joke or comedy skit. Even one of the more recent biographies published on Fillmore was actually a parody. As the unlucky 13th President, history has not been kind to Millard Fillmore. However, Fillmore's presidency wasn't as dull as believed. He was thrown into the presidency upon the sudden death of President Zachary Taylor during a significant time during our nation's history. There was the turmoil over the question of slavery in the new territories acquired after the war with Mexico. Possibly headed for Civil War, President Fillmore kept the country out of conflict with the Compromise of 1850. The compromise preserved the peace between the slave and non-slave states, but only for another decade. Fillmore also presided over a country that was gaining new found wealth and respect. The California gold rush was reaching its apex during his tenure. What Fillmore lacks in respect he more than makes up for with his ancestral connections to other famous people. The connections displayed here are only the tip of the iceberg. Perhaps you have a connection or two to President Fillmore. I know I have at least two.